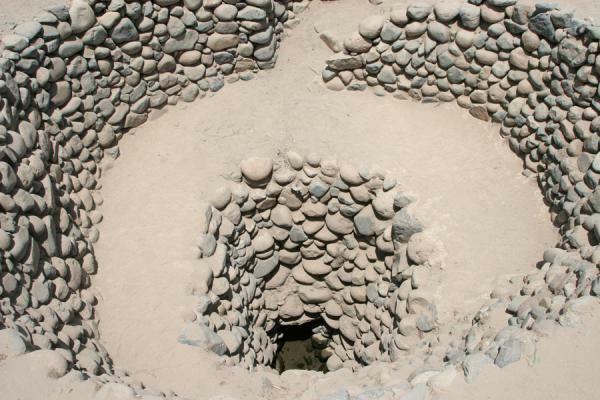 In order to survive the arid desert climate of Nazca, people have had to find a way to have access to water. In the 3rd to 6th century CE, aqueducts were built to provide for year-round access to water essential for permanent inhabitation and irrigation of the area. 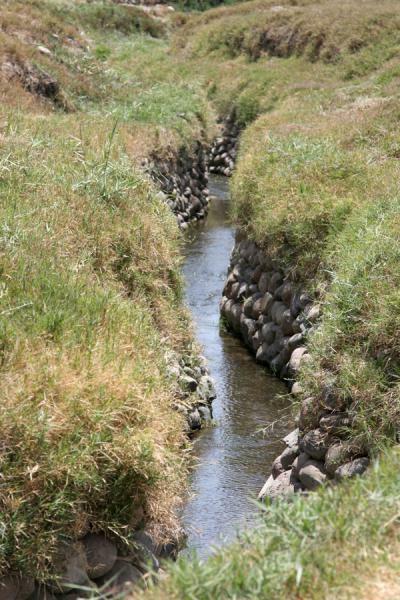 Water running in aquifers was channelled to where it was needed using man-made underground channels. Concentrical paths leading down to these underground channels provided for direct access to the water and the underground channel for maintenance - it is claimed that the shape was based on shells. 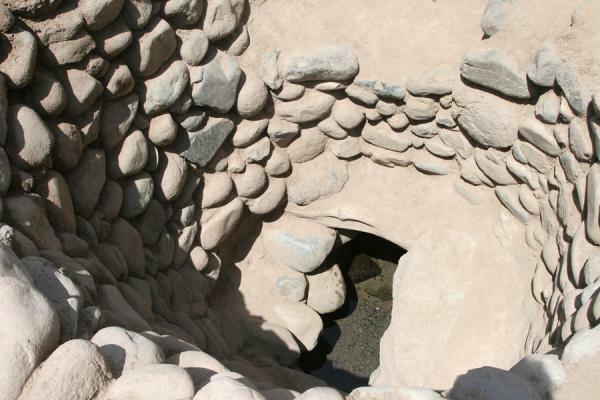 When we arrived from Nazca, we saw several large water tanks that were being fed by the ancient aqueducts, as the proud taxi driver pointed out. 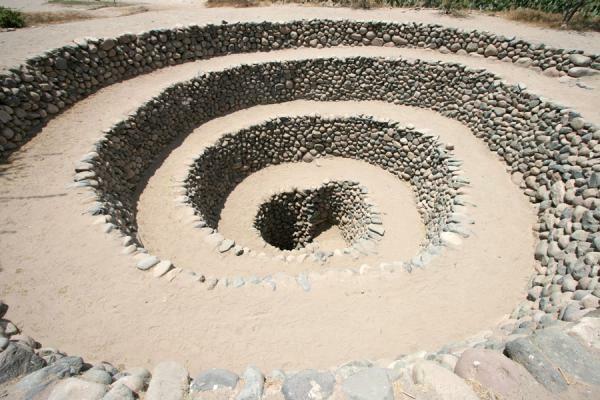 Farmers still use the water and partly depend on the clever work done by the ancient Nazcans, even though modern pumps now provide for most of the water in the area. 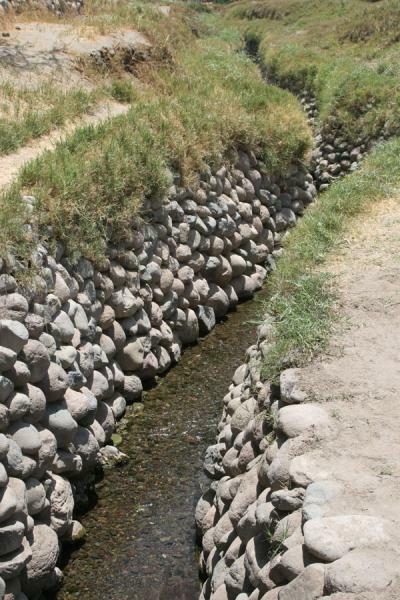 The channels, either underground or in the open air, are S-shaped to slow down the water flow and prevent it from running too fast in times of floodings. The Nazcans also constructed access points, which still now give direct access to clean and chrystal-clear water which is surprisinly warm. Man has always been smart to adapt to seemingly impossible conditions to live; the Cantalloc aqueducts prove once more that humans can survive in an area that certainly is not the easiest to live in. 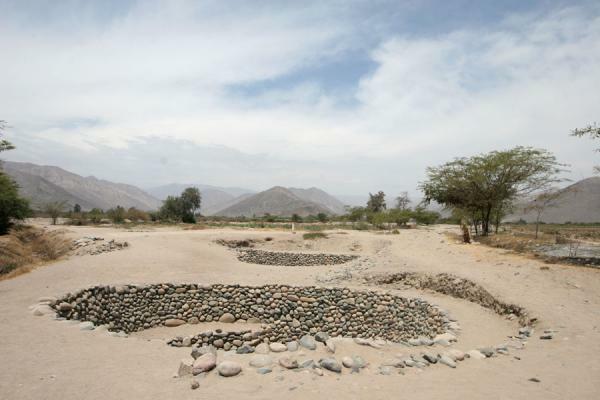 They knew that water coming down from the Andes was flowing not only in rivers, but also in aquifers, and intelligently tapped into these essential resources. Some even argue that the famous Nazca lines actually point to underground sources of water and that the symbols are hints of what can be found in the arid soil. Personal travel impressions both in words and images from Cantalloc Aqueducts (). Clicking on the pictures enlarges them and enables you to send the picture as a free e-card or download it for personal use, for instance, on your weblog. Or click on the map above to visit more places close to Cantalloc Aqueducts. 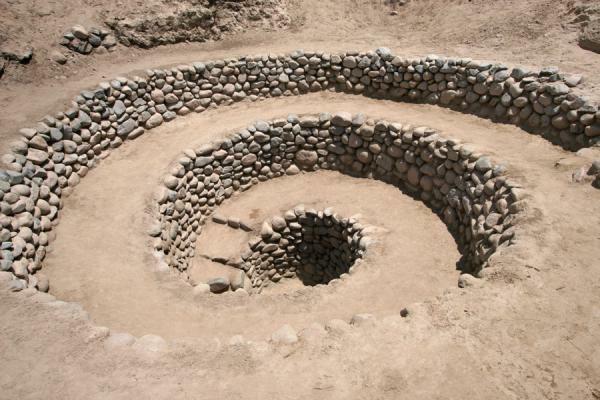 Book a hotel near Cantalloc Aqueducts, Nazca, Peru with low prices for all kinds of hotels - without reservation fees.